Ek Balam is an ancient Mayan Ruins site located about 2 hours drive north of Playa del Carmen near the North end of the Yucatan Peninsula. 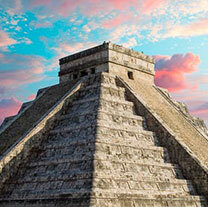 As it is only 35 miles from Chichen Itza, we offer a private tour that will visit both sites in one great day! Ek Balam is smaller than the other ruins sites, at about 2,500 acres, but it is incredibly well preserved and very impressive in it's own right - and much less crowded! THE MOST EK BALAM TOURS IN PLAYA DEL CARMEN! Ek Balam is believed to have started as early as 100 B.C. It wasn't a Mayan capital city, rather it served Tikibalon, which was the provincial capital. Ek Balam grew to prominence about 700 A.D. and continued to prosper until about 1000 A.D. It is believed to have started to dwindle out about 1200 A.D. Nobody is quite sure why, but one theory is that it was due to political unrest. Excavation began in 1886 under the guidance of Desire Charnay, but didn't get seriously underway until 1987. There are still uncovered buildings at the Ek Balam site. The biggest and most impressive structure at Ek Balam is called the Acropolis. It is nearly 100 feet high, and over 500 feet long. You can climb to the top of the Acropolis, where you can have mighty views stretching all the way to Coba, over 30 miles away! The Acropolis is a tomb built for Ukil-Kan-Lek-Tok, the leader of Ek Balam around 800 A.D. when most of the temples in the central plaza were built. The ruins are open from 8:00 AM to 5:00 PM every day.